The selection of preparedness shows on television has varied from crazy doomsday preppers to naked folks in the rain forest. Most are a bit over-dramatic (more than a bit if you ask my husband) because they are filmed and edited for entertainment and ratings, not for education. And most make us preparedness minded folks out to be just a little bit wacky. If you’re ready for some useful information in a positive, family friendly show that doesn’t make survival look crazy, be sure to check out Fat Guys in the Woods, a new show on the Weather Channel premiering this Sunday, August 10th at 10:00 EST. In Fat Guys in the Woods, Creek Stewart, a perfectly sane, fully clothed survival expert, escorts three regular guys into the woods for a week to teach them how to survive armed with very little gear. They spend the first few days working on survival skills together, building shelter, starting fire, and trying to find sustenance in the Smoky Mountains of Tennessee during last winter’s polar vortex. The same mountains where others needed rescued just days before. Then they are each turned loose in the woods for a night on their own. How do these three fat guys fare? You’ll have to watch. Creek is absolutely inspiring and positive the entire time. One of those guys who has you believing you can do this even if everything else says you can’t. The world needs more people builders like that. The show feels real. I have worked in television before and know some of the shenanigans that can go into making a shot look a certain way. These guys are no actors. I have no idea if there were multiple takes, but it doesn’t feel like it. They laugh, they get sentimental, they reverence the animal life that provides them food, I cried. Did I mention it’s family friendly? I don’t remember any foul language (if there was any, it was kept to a minimum), everyone is clothed, it’s not scary or crazy. My 10 year old daughter watched with me and loved it. Plus I’m a big believer in getting out of the house and enjoying the great outdoors and this show encourages that. Click here to play some survival trivia with Creek on the Today Show! 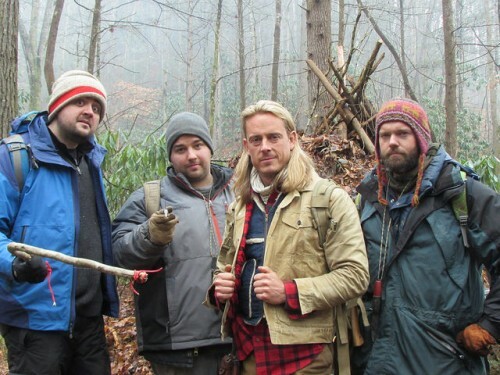 Fat Guys in the Woods premiers this Sunday, August 10th at 10pm EST on the Weather Channel. Go get your DVR set! As they say, “Get off the couch and into the weather”.